Now sold in AJ's Fine Foods across the valley! Introducing Arizona Animal Welfare League's Rescue Brew! Local, Ethical, Bold - Just like AAWL, Arizona’s oldest and largest no-kill shelter. With notes of chocolate and caramel, our Rescue Brew medium roast is the best way to start your morning while helping save homeless pets. 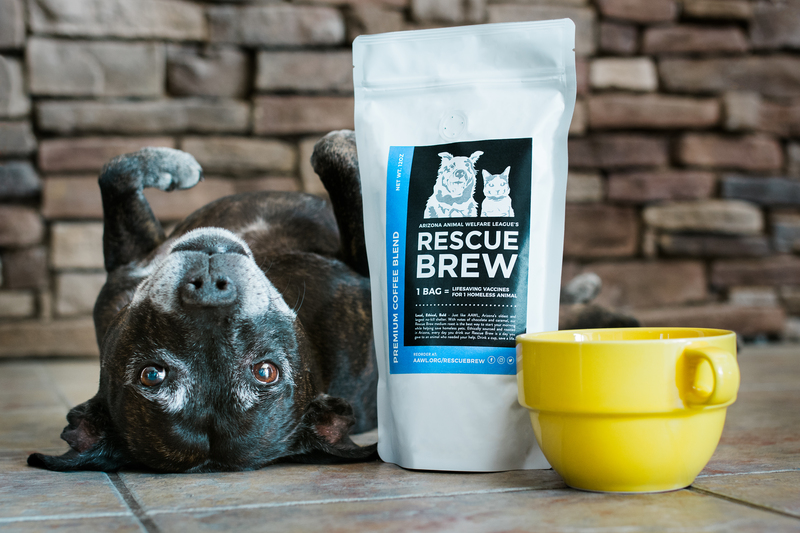 Ethically sourced, roasted in Arizona, every day you drink our Rescue Brew is a day you gave to an animal who needed your help. Drink a cup, save a life. Dark Roast- With a velvety dark chocolate palate, notes of black licorice and tobacco punctuated by a smooth, clean finish, this dark blend is for the coffee connoisseur. Sunrise Blend – You're off to a great start every morning with this bright, crisp eye-opener with caramel notes and sweet citrus aromas that are sure to get you up and keep you going! Full City Roast- Our most popular medium roast is always a crowd pleaser! With a rich, milk chocolate flavor and subtle notes of cedar this blend pairs well with everything; a full breakfast or after dinner delight. Swiss Mountain Mocha- Chocolate, chocolate, chocolate! The aroma of our milk chocolate flavored coffee will put your mind at ease and each sip will melt in your mouth. A perfect dessert or anytime at all- no special occasion necessary to celebrate with this delicious blend. Shipping for 12oz bags: $6.50/bag, and will be added during checkout. Or, order 2 bags and select the 2 bag special below and BOTH bags ship for $6.50! Shipping for 3lb bags: $7.50/bag, and will be added during checkout.